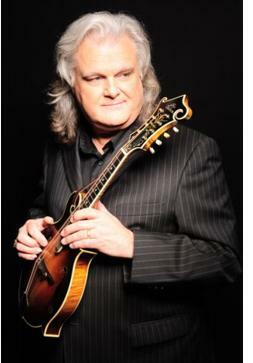 Nashville, Tenn. (September 7, 2016) -- The musical honors just keep pouring in for country and bluegrass legend Ricky Skaggs. Last week, Skaggs learned he would receive this year's prestigious ASCAP Founders Award and today it was announced that the 14-time GRAMMY® winner will be inducted into the Musicians Hall of Fame. "What an incredible honor it is for me to be inducted into the Musicians Hall of Fame," says Skaggs. "Just to be named alongside so many of my musical heroes is really humbling. I'm grateful to all of the musicians who have gone before me and left a trail that I have followed and learned from. I'm so thankful for this honor." In addition to Skaggs, this year's inductees include Garth Brooks, the late Jerry Reed, Brooks' studio backing band, the G-Men and the Sigma Sound Studio Rhythm Section. An induction ceremony and concert will be held on Wednesday, October 26, at 7 p.m. at the Municipal Auditorium in downtown Nashville. The Municipal Auditorium is home to the Musicians Hall of Fame and Museum, a 501(c)(3) non-profit organization, and GRAMMY Museum Gallery™ at Musicians Hall of Fame. Tickets will be available through Ticketmaster on September 12. From Jimi Hendrix to Hank Williams, the Musicians Hall of Fame celebrates the achievements of musicians from virtually every decade since the golden era of studio recording, starting in the 1950s, and from every corner of the country. With education being paramount, each section of the museum focuses on an important city in the history of American music – including but not limited to Detroit, Los Angeles, Muscle Shoals, Atlanta, Memphis, and Nashville, and explores each area's contributions. The museum focuses on the session musicians who may not be well known to the public, but played on thousands of iconic recordings. The induction ceremony and concert honors new members, nominated by the American Federation of Musicians and other music industry professionals, and ensures the continued growth of the Musicians Hall of Fame. The GRAMMY Museum Gallery™ is an interactive music space, which permanently opened at the Musicians Hall of Fame in April 2016. The Musicians Hall of Fame has been awarded many accolades including a Music City Brand Champion by the Nashville Convention & Visitors Corp., TripAdvisor Certificates of Excellence, and has been covered in national outlets such as The Wall Street Journal, USA Today, Chicago Tribune, The Washington Post, ABC News, San Francisco Chronicle, Rolling Stone, and National Geographic Travel. For additional information, please visit www.musicianshalloffame.com. Earning 12 #1 hit singles, 14 GRAMMY® Awards, 11 IBMA Awards, nine ACM Awards, eight CMA Awards (including Entertainer of the Year), two Dove Awards, three honorary Doctorate degrees, a GMA Gospel Music Hall of Fame induction, the Country Music Hall of Fame and Museum's 2013 Artist-In-Residence, an Americana Music Association Lifetime Achievement Award in the Instrumentalist category along with countless other awards, Ricky Skaggs is truly a pioneer of Bluegrass and Country music. Since he began playing music more than 50 years ago, Skaggs has released more than 30 albums and has performed thousands of live shows. He started his own record label, Skaggs Family Records, in 1997 and has since released 12 consecutive GRAMMY®-nominated albums. His newest release, Hearts Like Ours, with his wife, celebrated artist Sharon White of The Whites features the couple dueting on handpicked country love songs. The Grand Ole Opry member has released his first-ever autobiography, "Kentucky Traveler." The book details the life and times of Skaggs and provides a descriptive history of Country and Bluegrass music, as told by the master himself. In addition to his regular touring schedule with his band, Kentucky Thunder, he has recently performed a string of dates with his better half Sharon White along with guitar legend Ry Cooder on the critically-acclaimed "Cooder-White-Skaggs" tour and from time to time continues to hit the road with versatile singer/songwriter and pianist Bruce Hornsby on another critically-acclaimed tour, "Ricky Skaggs & Bruce Hornsby with Kentucky Thunder."